Gossypium herbaceum and Gossypium arboreum, with their short and thick fibres, are mainly cultivated in Asia. Gossypium barbadense, native from tropical regions, gives us what we call « Egyptian » cotton, characterized by long and very fine fibres. It is the most sought-after cotton. Egypt actually only started its commercial culture around the beginning of the 19th century. Gossypium hirsutum, originally from Central America, is the most common, with medium sized fibres. It accounts for more than 90% of the world production. Ancient traces of cotton cultures are found in India and Pakistan, dating as far back as 2500 B.C, but it was also cultivated in South America at the same period. The name we use today probably comes from the Arabic word « qutun ». The part of the plant used to make fabric is the long fibres contained in a capsule called bolle, in which are located the cotton seeds. They are naturally light cream coloured. Other parts of the cotton plant are also used to make oil and animal feed. The majority of the production now comes from China, India and the United States. While historically known for their cotton, Egypt and Turkey only make up a small fraction of the exportations today. Two main characteristics will define the quality of the cotton fibre: the length of the fibres, and their thinness (thinner is better). The length of the fibres used in the textile industry will vary from 18 to 40 mm. Shorter fibres are used to make cotton wool for various uses, while the longer ones are spun into yarns. 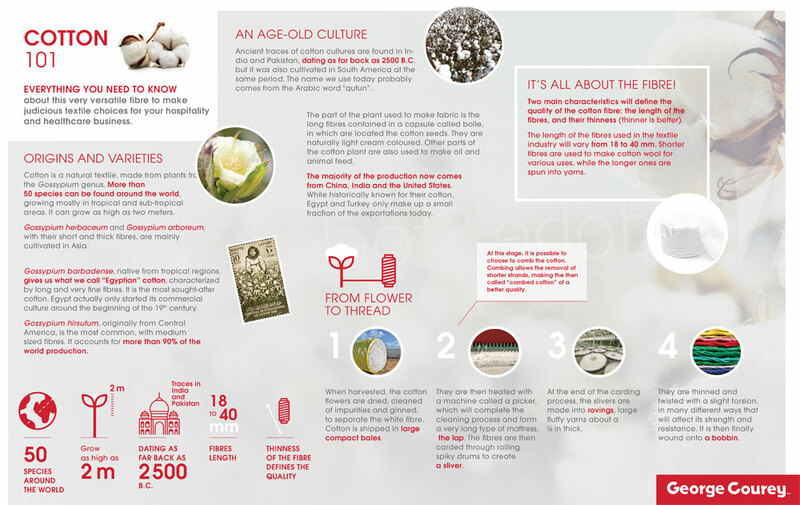 When harvested, the cotton flowers are dried, cleaned of impurities and ginned, to separate the white fibre. Cotton is shipped in large compact bales. They are then treated with a machine called a picker, which will complete the cleaning process and form a very long type of mattress, the lap. The fibres are then carded through rolling spiky drums to create a sliver. At this stage, it is possible to choose to comb the cotton. Combing allows the removal of shorter strands, making the then called « combed cotton » of a better quality. At the end of the carding process, the slivers are made into rovings, large fluffy yarns about a ¼ in thick. They are thinned and twisted with a slight torsion, in many different ways that will affect its strength and resistance. It is then finally wound onto a bobbin. Jeanguyot, Michelle (2008). Le coton au fil du temps. Quae Editeur. 144 p.
Whyman, Kathryn (1988) Les textiles. Collection Ressources d'aujourd'hui. Éditions Gamma, 32 p.
Hallett, Clive (2010) Mode : Guide des textiles - Les fibres naturelles. Eyrolles, 208 p.
Reis, Danielle ( 2006) Le monde des fibres. Belin, 351 p.
Cook, J. Gordon (2008) Handbook of textile fibres. Vol.1 - Natural Fibres. Woodhead Publishing Ltd, 208 p.